© Rossi et al. ; Licensee Bentham Open. In the acute phase of ischemic stroke the relationship between blood pressure (BP) and clinical outcome remains not clear. The aim of our study was to evaluate the association of stroke severity and BP measurements in the acute phase of stroke, and whether early variation of neurological status affects BP profiles. BP on admission was obtained with mercurial sphygmomanometer and 24h-ambulatory BP monitoring (ABPM) was performed on days 1st and 6th. Enrolled patient were grouped according to the neurological deficit at onset (graded by the NIHSS) in group A, (NIHSS score ≤ 10, mild/moderate) and group B (NIHSS score > 10, moderate/severe) and according to the occurrence of early neurological improvement, defined as a NIHSS score reduction of at least 4 points at the 6th day in group C (improved) and in group D (not improved). A total of 57 patients were enrolled. On admission sphygmomanometric systolic BP values were higher in group A with respect to group B (158,5 mmHg ± 26,9 vs 147,7 mmHg ± 15,5 respectively; p = 0.6) whereas no difference was found in ABPM. On admission sphygmomanometric BP and ABPM were similar in group C and group D. At the 6th day ABPM, both systolic BP and diastolic BP values were significantly reduced in clinically improved patients (Δ systolic BP 1st to 6th day = 9,9±13,3 in group C vs 0,5±17,6 in group D, p < 0,05; Δ diastolic BP 1st to 6th day = 5,1± 8,4 mmHg in group C vs 1,3 ± 9,7 mmHg in group D, p = ns) whereas no change in the 24-h BP profile was observed in patients without early improvement. BP on admission in not related to the stroke severity and does not predict early neurological outcome and patients that show an early neurological improvement show also a reduction of the BP profile. Keywords: Acute ischemic stroke, blood pressure. Hypertension occurs in up to 60-80% of the patients with acute cerebrovascular disease. Many studies investigated the relationship between hypertension in the early phase of acute stroke and clinical outcome, but results are conflicting. In fact, some Authors found that high blood pressure (BP) is associated with poor outcome, mainly due to an increased risk of stroke recurrence, cerebral oedema, or haemorrhagic transformation of the infarct, whereas other Authors found that hypertension ameliorates outcome, increasing the cerebral blood flow in the ischaemic penumbra. In agreement with the former, the Intravenous Nimodipine West European Stroke Trialists (INWEST) found, in an observational study, that high initial BP was one of the independent predictors of poor outcome at 21 days in patients with acute ischaemic stroke . In a systematic review of available observational studies, Willmot et al. found that there is a positive association between high BP at admission and poor outcome, probably due to early recurrence or re-bleeding, and suggested that moderate lowering of a high BP might reduce early death and deterioration and late death and dependency ; however, the author himself pointed out that it could not be established if the effect of high BP was a direct one, or otherwise dependent on other factors, mainly stroke severity. He also considered that timing of measurement is a crucial point (from hospital admission up to 48 hour), due to the reported spontaneous decrease in BP after the first hours of stroke, and the established association of large infarct with high BP. Other Authors [3-5] found a U-shaped relationship between baseline systolic BP (SBP) and adverse clinical outcome (both early mortality and late mortality or dependency), thus indicating that elevated as well as low BP values aggravate prognosis. In the IST population  the lowest frequency of poor outcome was observed in patient with baseline SBP of nearly 150 mmHg, and remained low between 140 and 180 mmHg. In disagreement with these results, Semplicini et al. found better outcomes in patients with high initial BP, and they suggested that hypertension is probably a mechanism to maintain cerebral perfusion . Researchers have recently focused their attention on BP time course in the first 24 hours from stroke onset, more reliable than the single basal measurement. However, also in these studies the relationship between BP trends and outcome was still conflictual. In three studies conducted in the first hours from stroke, Castillo et al. showed that a reduction in blood pressure greater than 20 mmHg was associated with poor outcome at 3 months , whereas, oppositely, Christensen et al. found better outcomes in patients with spontaneous fall of BP  and Vemmos et al. found a relationship between persistently elevated SBP at 24-hours monitoring and subsequent brain oedema formation . In line with the latter, Sartori et al. found that a small BP reduction (between 5 and 14 mmHg in mean BP) during the first 24 hours, either spontaneous or drug-induced, was associated with a better prognosis at 3 months, and the lack of BP reduction indicated a more severe stroke and a poorer outcome . At present, the relationship between BP and clinical outcome in acute stroke remains a dilemma: is it hypertension that influence clinical outcome or vice versa is BP rising only an epiphenomenon of stroke severity? The aim of our study was to evaluate the association of stroke severity and BP measurements obtained with 24h-ambulatory BP monitoring (ABPM) in the acute phase of stroke, and whether early variation of neurological status affects 24-hour BP profiles. We prospectively studied 57 patients, mean age 69,4± 13.8 years, range 26-87, consecutively admitted to our Emergency Department (ED) with acute ischaemic stroke with onset within six hours. The study was conducted between January 2004 and April 2006. The diagnosis of stroke was based on clinical presentation and basal brain CT scan, which was performed in all patients and repeated after 48-72 hours. Stroke severity was graded with the National Institutes of Health Stroke Scale (NIHSS), administered on admission and daily up to the 6th day . The pathogenesis of stroke was assessed using the TOAST classification , which distinguishes five subtypes of ischaemic stroke: large-vessel atherothrombotic; cardioembolic; small-vessel occlusive disease (lacunar infarct); of other aetiologies; of undetermined cause (incomplete work-up or more than one possible aetiology). The possible involved vascular territory was assessed with the Oxfordshire Community Stroke Project (OCSP) classification, which identifies four subtypes according to clinical features: total anterior circulation infarct (TACI), partial anterior circulation infarct (PACI), lacunar infarct (LACI), and posterior circulation infarct (POCI) . Most of the patients were included in the SETIS study (Study Efficacy Tirofiban Ischaemic Stroke), a randomized, double-blind antiplatelet treatment trial . After authorisation for thrombolysisis and adhesion to Sits-Most register, patients presenting within three hours were treated with i.v. r-TPA (a total of 2/57). We excluded patients with deep coma, evidence of haemorrhage at CT scan, atrial fibrillation, need of antihypertensive drugs during the acute phase and ABPM registration. BP on admission was obtained with mercurial sphygmomanometer. ABPM was performed on days 1st and 6th; an automated oscillometric device Mobil-O-Graph was placed in the non-dominant arm. BP readings were obtained every 10 minutes during the day and every 20 min during the night. The accuracy of this device has already been established according to criteria proposed by the British Hypertension Society . Either a large adult or normal adult cuff size was used, as appropriate for the patient’s mid-upper-arm circumference. group B, moderate/severe neurological deficit, NIHSS score > 10, 21 patients. group D, not improved, 16 patients. For general descriptive statistics mean and SD, median and IQR (in relation to the whether or not they were normally distributed), or frequencies are given for continuous, ordinal or categorical variables. Comparisons of BP and ABPM parameters between groups were made with Student t test for unpaired data; comparisons of frequencies were made with chi-squared or Fisher exact test. Spearman test was used for correlations. Logistic regression analysis was used to evaluate the dependence of BP reduction on the following independent variables: gender, age, type of infarct according to the involved territory (OCSP classification), NIHSS score, early neurological improvement. For this purpose variables were categorised as follows: Δ-SBP (difference between mean 24-hours SBP at ABPM, recorded during the 1st and the 6th day) divided in terziles (0= first, 1=second, 2= third terzile), gender (0=males, 1= females), age, early neurological improvement (NIHSS score reduction ≥4 points at the 6th day), history of hypertension, territory LACI or TACI (0 = no, 1 = yes). The probability value <0,05 was considered statistically significant; all probability values were two-sided. For statistical analysis we used SPSS version 14. A total of 114 ABPM recordings was performed, 70 during the first day, and 58 at the sixth day. Basal recording started within 6 hours from stoke onset. Eleven ABPM recordings were incomplete or not analysable due to artefacts; two patients did not receive the second ABPM recording because they died. For the purpose of the study, we included all the patients with complete and successful recordings at both the first and the sixth day, with a total of 57 patients being included. Of the 57 patients included in the study, 28 were males and 29 females; mean age was 69.5 ± SD 13.8 years. The general characteristics and clinical history of the study population, the distribution of ischemic stroke subtypes according to the OCSP classification and etiopathogenetic subtypes according to the TOAST classification are given in Table 1, that also shows the characteristics of the patient population divided in the subgroups defined above. Mean NIHSS score at admission in the ED was 10,5 ± SD 5,3 (IQR: 6-13,5). No difference was observed as regards the frequency of principals cardiovascular risk factors. Sphygmomanometric values obtained in the ED were: SBP 154,4 ± SD 23,7 mmHg (range 100-220), DBP 83,4 ± SD 13,4 mmHg (range 54-110); 40 patients (70%) were hypertensive according to the cut-off value of 140/90 established by the Hypertension Societies. BP values obtained at ABPM monitoring at presentation and after six days are reported in Table 2. Forty-one patients (72%) decreased their NIHSS score by more than 4 points, whereas in the remaining sixteen patients (18%), a less degree reduction or an increase in the score was observed. As concerns the three-month functional outcome assessed with the Rankin scale, 34 patients had a mRS score of 0-1, five of 2, 13 of 3-4, two of 5, and three died within the end of the follow-up period. There was a strong relationship between early neurological improvement and three-month functional outcome: 36/41 (88%) patients with early improvement at sixth day had a follow-up mRS score ≤ 2 at three-month, with respect to 3/16 (18%) in those without early neurological improvement. Thirty-six patients had a NIHSS score <10 at presentation (group A, mild/moderate neurological deficit) and 21 patients had a NIHSS score ≥10 (group B, moderate/severe neurological deficit). As shown in Table 3, sphygmomanometric BP values in the ED was higher (thought approaching significance) in less severe strokes with respect to more severe ones (SBP 158,5 mmHg ± 26,9 and diastolic BP (DBP) 85,8± 13,1 in group A vs 147,7 mmHg±15,5 and 79,4±13,2 mmHg in group B; p = 0.6 and p = 0.08 for SBP and DBP respectively) whereas no difference was found in 24h-mean SBP and DBP values recorded at basal ABPM (SBP 140,8±18,9 and DBP 81,5±10,5 in group A vs 145,1±20,6 and 79,2±11,6 mmHg in group B; p=ns and p=ns for SBP and DBP respectively). As also shown, 24 hour mean BP measured with ABPM was similar to sphygmomanometric values in severe strokes but very differed in less severe ones. At the 6th day mean NIHSS score was 4.98±6.0 (IQR: 1-8), with an overall reduction of 5,5±4,2. A score reduction ≥4 points was observed in 41 patients (group C, early neurological improvement), whereas 16 patients did not reach such a score reduction or increased their scores (group D, not improved). Basal NIHSS score was significantly different in the two groups (9,5 ± 4,6 in group C and 13,3 ± 6,2 in group D p< 0.05), with a significantly higher prevalence of TACI vascular territory in group D. Mean age was higher in group D with respect to group C (Table 1). As shown in Table 4, BP on admission in the ED was similar in the two groups (SBP 154,4±21,7 and DBP 84,0±13,2 in group C vs 154,7±29,0 and 81,8±14,0 in group D, p=ns and p=ns for SBP and DBP respectively), as well as the 24h-mean BP values at basal ABPM (SBP 141,4±20,3 and DBP 80,8±10,8 in group C vs 144,9±17,7 and 80,4±11,2 in group D, p=ns and p=ns for SBP and DBP respectively). At the 6th day-ABPM, both SBP and DBP values were significantly reduced in clinically improved patients, whereas no change in the 24-h BP profile was observed in patients without early improvement (Δ SBP 1st to 6th day = 9,9±13,3 in group C vs 0,5±17,6 in group D, p < 0,05; Δ DBP 1st to 6th day = 5,1± 8,4 mmHg in group C vs 1,3 ± 9,7 mmHg in group D, p = ns) (Fig. 1). 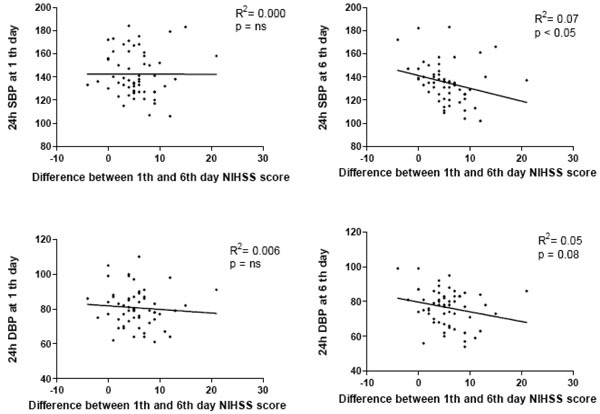 Correlation between the entity of systolic BP decrease (ΔSBP from 1st to 6th day) and the entity of NIHSS score reduction (ΔNIHSS from 1st to 6th day). The entity of NIHSS reduction at sixth day did not correlate with basal 24 hour systolic BP values, whereas it was inversely correlated with 24 hour BP values at the sixth day (R2: 0,07; p<0,05) (Fig. 2). 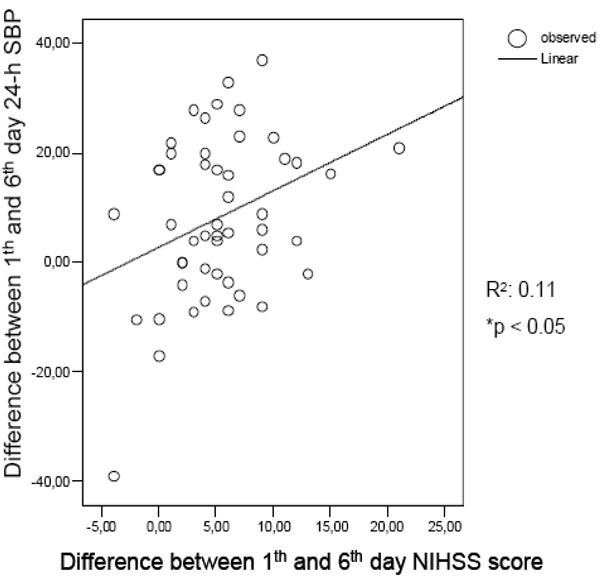 Correlation between 24 h blood pressure values at 1th and at 6th day from stroke onset and the entity of NIHSS score reduction (ΔNIHSS) from 1st to 6th day. A result of present study concerns the relationship between BP and stroke severity. BP measured with sphygmomanometer in the ED was higher in less severe strokes with respect to more severe ones, whereas mean BP values obtained with the basal 24h monitoring were similar. As suggested in previous studies , we think that BP values obtained with sphygmomanometer in the ED are influenced by stress and environment reactivity, which less affects the more reliable technique of ABPM and critically ill patients, according to other authors . Notably, BP values recorded with the two methods were greatly different in less severe stroke group, of nearly 18 mmHg in SBP. A second result concerns the relationship between BP at onset of stroke and clinical neurological outcome. In the two groups with favourable (at least 4 points decrease in NIHSS score) or unfavourable early neurological outcome, sphygmomanometric BP in ED and at basal 24 hour BP monitoring were similar; this does not support the observation that neurological outcome is predicted by BP at stroke onset and supports the hypothesis that hypertension is a compensatory mechanism to maintain an adequate flow in the penumbra. This is line with our observation concerning BP trends and neurological courses: at the 6th day monitoring BP was significantly reduced in neurologically improved patients, with a mean decrease in SBP of nearly 10 mmHg (from 141.4 to 131.5 mmHg); oppositely, patients who did not improve, showed the same 24-hour BP profile at the second ABPM monitoring. Moreover the degree of early neurological improvement (NIHSS score reduction) was not related to BP values at basal ABPM, but was significantly related to BP values at the second monitoring. Also Christensen found a different course of BP in severe versus non severe cerebral infarcts, and reports a spontaneous decrease of BP in the first hours after mild strokes or TIA, a model of early reperfusion of ischemic brain area. Limits of our study are consistent with the selected population: all the patients with atrial fibrillation, about one third of usual stroke population, were excluded to make possible ABPM technique. Moreover in our series BP values tend to be lower than other series (it’s reported that in a series with a lot of patients with SBP lower than 160 mmHg, a relation between BP and outcome could be missed), and neurological deficit were of moderate degree; this was due to the selection, for therapeutical purpose, of the patients included. In this context, we did not evaluate the prognostic value of hypertension, but simply evaluated pressure profiles, in relation with neurologic course, in patients with homogeneous treatment (SETIS trial). In conclusion BP on admission in not related to the stroke severity and does not predict early neurological outcome and patients that show an early neurological improvement show also a reduction of the BP profile. Normalization of BP profile could be the consequence of neurological improvement. Ahmed N, Wahlgren G. High initial blood pressure after acute stroke is associated with poor functional outcome J Intern Med 2001; 249: 467-73. Willmot M, Leonardi-Bee J, Bath P. High blood pressure in acute stroke and subsequent outcome: a systematic review Hypertension 2004; 43: 8-24. Leonardi-Bee J, Bath PMW, Phillips SJ, Sandercock PAG. Blood pressure and clinical outcomes in the International Stroke Trial Stroke 2002; 33: 1315-20. Vemmos KN, Tsivgoulis G, Spengos K, et al. U-shaped relationship between mortality and admission blood pressure in patients with acute stroke J Intern Med 2004; 255: 257-65. Castillo J, Leira R, García MM, Serena J, Blanco M, Dávalos A. Blood pressure decrease during the acute phase of ischemic stroke is associated with brain injury and poor stroke outcome Stroke 2004; 35: 520-7. Semplicini A, Maresca A, Boscolo G, et al. Hypertension in acute ischemic stroke Arch Intern Med 2003; 163: 211-6. Christensen H, Meden P, Overgaard K, Boysen G. The course of blood pressure in acute stroke is related to the severity of the neurological deficits Acta Neurol Scand 2002; 106: 142-7. Vemmos K, Tsivgoulis G, Spengos K, et al. Association between 24-h blood pressure monitoring variables and brain oedema in patients with hyperacute stroke J Hypertension 2003; 21: 2167-73. Sartori M, Benetton V, Carraro AM, et al. Blood pressure in acute ischemic stroke and mortality: a study with noninvasive blood pressure monitoring Blood Pressure Monitoring 2006; 11: 99-205. Goldstein LB, Samsa GP. Reliability of the National Institutes of Health Stroke Scale Stroke 1997; 28: 307-10. Adams HPJr, Bendixen BH, Kappelle LJ, et al. Classification of subtype of acute ischemic stroke: definitions for use in a multicenter clinical trial: TOAST Trial of Org 10172 in Acute Stroke Treatment Stroke 1993; 24: 35-41. Bamford J, Sandercock P, Dennis M, Burn J, Warlow C. Classification and natural history of clinical subtypes of cerebral infarction Lancet 1991; 337: 1521-6. Torgano G, Zecca B, Monzani V, et al. Effect of intravenous Tirofiban and aspirin in reducing short-term and long-term neurological deficit in patients with ischaemic stroke. A double-blind randomized trial. Study of Efficacy of Tirofiban in acute Ischaemic Stroke (SETIS) Cerebrovasc Dis 2010; 29: 275-81. Jones CR, Taylor K, Chowienczyk P, Poston L, Shennan A. A validation of the Mobil O Graph (version 12) ambulatory blood pressure monitor Blood Pressure Monitoring 2000; 5: 233-8. The National Institute of Neurological Disorders and Stroke rt-PA Stroke Study Group. Tissue plasminogen activator for acute stroke New England Journal of Medicine 1995; 333: 1581-87.